Hi, I’m Jan. I love all of our East Wind Nut Butters, but I’d have to say that our roasted cashew butter is my favorite. I do my part in our business by helping to keep our nut butter factory sparkly clean and sanitary. 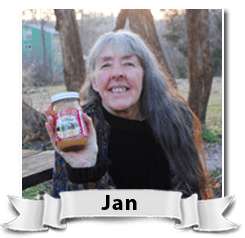 I love to cook for our community of nearly seventy people, and I love using our delicious and nutritious nut butters in the food that I cook. 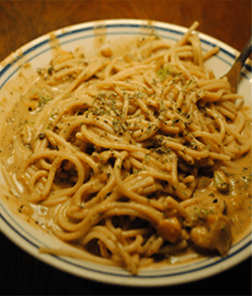 Some of my favorites are tasty pasta with peanut sauce or delightful peanut butter muffins. I think East Wind makes the best peanut butter in the world, and our customers deserve the best—just like I do. We love to prepare and eat delicious food at East Wind! Here are some of our favorite nut butter recipes. We have included one recipe for each nut butter, taste-tested and approved by community members. We hope you like them! If you would like more recipes, you'll be happy to hear that we are currently working on a new cookbook, which will have these and many more nut butter recipes. It will be available soon. Red curry paste and fish sauce are available from Asian food markets. Fish sauce is non vegetarian. You can leave it out if you want but it won’t have the same zing. In a sauce pan, combine all ingredients and let simmer for 15 minutes while stirring frequently. Serve over Asian noodles or other pasta. You can also chill, and serve over shredded lettuce as a salad. 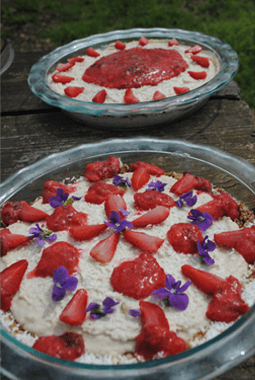 This is a recipe for a raw and vegan cashew butter cheesecake. Who says vegans don’t get delicious desserts too? Hummus is a Middle Eastern or Arabic delicious spread made from chickpeas, lemon juice and Tahini. Sometimes we will make a whole batch and keep it the fridge for everyone to snack on throughout the week. We eat it on a whole range of things including chips, sandwiches, rice, or on a snack platter served with olives and cheese. 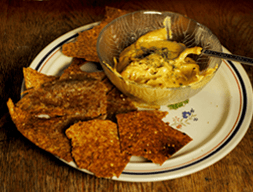 We also recommend experimenting with spices you enjoy to flavor the hummus. Some combinations we like here are cayenne, parsley and paprika, or thyme, sage, parsley and oregano. Mash chickpeas in a food processor or heavy duty blender. Add the remaining ingredients, stirring until well combined. Enjoy! This is a recipe for a sweet nutty almond bar. 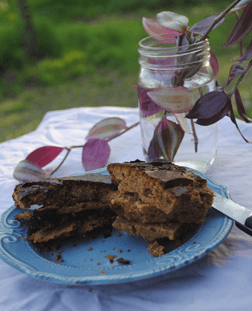 This recipe is great if you are looking for a healthier dessert. Try garnished with whipped cream, or topped with more nuts. These almond butter bars are simple to prepare. First preheat the oven to 350 degrees. To make the filling mix together all the ingredients (it does matter in what order). Then in a separate bowl mix all the ingredients for the crust. After oiling your baking tray press the crust into the bottom of the pan. You want about a ½ “- 1” layer. Then add the filling on top, spreading until evenly distributed. Bake in the even for about 15-20 minutes, watching to determine when cooked thoroughly. Enjoy!